The 9 Best Ice Cream Parlors in Kansas! Kansas ice cream parlors come in mom and pop shops, in historic buildings and in modern spaces, but the awesome flavors are unique to everyone. In Kansas, we take our ice cream serious and we like it homemade, handmade or dipped! Here are the 10 best ice cream parlors in the state. Clark Drug, Soda & Ice Cream Parlor in Cimarron is locally owned and operated as simply as is was when it opened in the 1930s. The timeless soda fountain offers ice cream lovers the opportunity to create their own flavor servings. It doesn’t matter how you serve it in a cone, a cup, a malt or shake it’s going to taste good. Katie’s Goody Shop in Ulysses serves hand scooped, homemade ice cream almost every day of the week. And if you need a cookie or a cupcake to complete you snack, they can add those treats too! If it is awesome ice cream you are longing for, then drop by the K-State’s Dairy Bar and choose your favorite flavor. A K-State legendary experience that satisfies those college cravings for great ice cream. Visit this 100-year-old soda fountain inside The Linger Longer Soda Fountain & Sandwich Shop in Bennington. The soda jerks in this shop do it the old-fashioned way mixing soda drinks by hand. 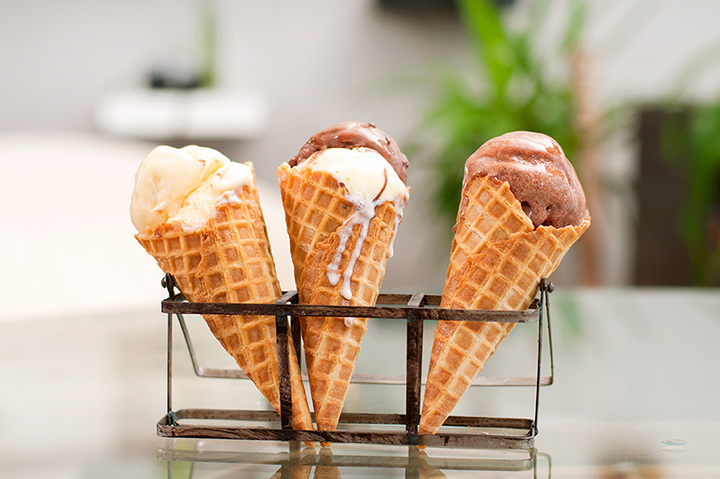 And the ice-cream can be served in a homemade waffle cone or inside a delicious malt or shake. The Churn & Burn in Wichita says it’s a “little store with lots of flavor” and serves fresh made ice cream instantly. A fun place to eat your favorite ice cream flavor and enjoy a friendly atmosphere. The ice cream servings are unlimited at the Dips & Sips in Mission. Hand dipped ice cream served in several different ways including the popular “explosion” and “flavor bursts” which could be added with 16 different toppings or simply served alamode! Stop by and visit Sylas & Maddy’s Homemade Ice Cream store in Lawrence and Olathe. A family-run business that is dedicated to creating and serving delicious handmade, craft ice cream to the greater Kansas City area. Crave a unique flavor of ice cream, make a note and take it in on your next visit. Bogey’s in Salina is both an ice cream shop severing great ice creams and over 100 milkshake flavors, and a mainstay burger joint. Both options are favorites at Bogey’s. Great atmosphere, great food and the best ice cream around! The Dairy Barn in Wathena is known to locals as a sweet ice cream shop that serves food. You can buy ice cream by the cone, pint or quart. No matter how you choose to savor the varieties of ice cream, you will always be back for more.